4-Star Hamilton Heroes 4-H club has been a club for 8 years and we presently have 11 members. Our club is very diverse club ranging from livestock production to food preservation and anything in-between. The club also does a variety of community service projects throughout the year. The main focus of our club has been livestock production. We have members who have cattle, hogs, sheep, goats, poultry, and small animal projects. The club has done a variety of activities to enhance our members understanding of the livestock industry. Members have toured the Meat Animal Research Facility in Clay Center looking specifically at sheep and cattle production. We have also attended showing and fitting clinics as well as livestock judging competitions. Our members participate in the Premier Animal Science Event in Lincoln each summer. During the past year we have had workshops on horticulture, woodworking, speech and photography. The year we are planning to have workshops on welding, crocheting and grains. In the past year we have erected 4-H welcome signs in four places along highways coming into our county. We have also helped paint livestock barns at the fairgrounds as well as help develop a small tree nursery at the fairgrounds as well as plant trees in part because of the tree planting project. Other service activities include: calling bingo at our assisted living facility, working the concessions at our local movie theater each month and working the food booth at the county fair. Currently, we are planning to assist our local Relay for Life activity by putting banners up around town to promote the activity as well as being in charge of putting up all of the luminaries the night of the event. 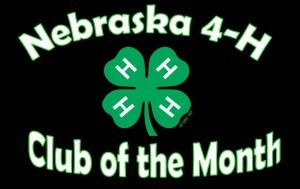 The Nebraska 4-H Foundation and Nebraska 4-H Ambassadors are proud to call the 4-Star Hamilton Heroes 4-H Club of the Month for March 2013. The Nebraska 4-H Ambassadors together with the Nebraska 4-H Foundation provide the 4-H Club of the Month program to all Nebraska 4-H clubs throughout the state. Clubs can nominate themselves by telling why their club should be chosen as Club of the Month. A different club will be chosen each month and will be awarded with a certificate and $50 cash card. To see past recipients or to nominate a club for Club of the Month click here. No Comments to "4-Star Hamilton Heroes – Club of the Month"